A few days ago, I bought a package of flower-shaped Post-Its. 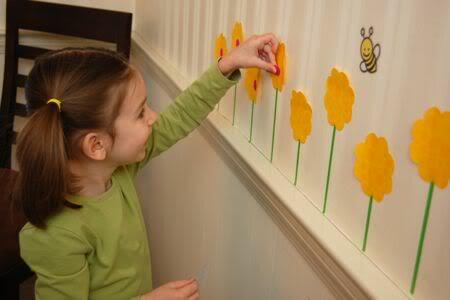 We couldn’t resist making an inexpensive no-mess Spring mural with them! While Clara was napping this afternoon, Emily helped me take down the four leaf clovers in the sewing room and replace them with colorful flowers! One pack of Post-Its comes with three different colored flowers. We used color coding labels for the centers of the flowers. Using a cheap roll of craft paper, I cut out the shape of a tree branch, and used masking tape to hold it to the wall. Emily had a go at it with the pink flower-shaped Post-It notes. She kept adding more and more flowers…. …and it helped brighten up an otherwise rainy afternoon! I love it!!! Ask Emily if she'll come do our room too. I bought a pack of star post-its after you blogged about using them, looks like I'm headed out today in search of flower post its. You always have the BEST ideas!! Wow, it looks great! I think our arts and crafts room could use a post-it makeover! Is the "sewing room" ever going to return to being a dining room? Can't write more, I'm off to get some flowershaped post-its! I wish we had all that wall space 🙂 The tree looks very cheerful. I bet Clara was excited when she woke up from her nap. Wow, you never cease to amaze me! 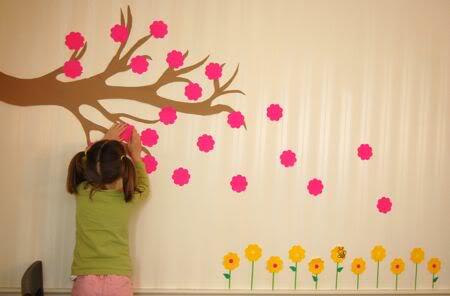 Looks similar something I saw but post-its are so much more cost effective! And I love that you can change with the seasons. Did you paint the tree yourself? @ Joyful Learner — I drew the branch on some brown craft paper. It was quick and easy! @ Mark — Never! It's mine! All MINE! Defend your sewing room! DEFEND DEFEND! Love it! I think I might need to get my own flower-shaped Postits too! I LOVE it! Very bright and colorful. I think we need to make that before our Easter gathering. @ Raising a Happy Child — When Clara woke up, she looked at it and said, "Oh! WOW!!" @ Ricki — That's so sweet! Thank you so much! Beautiful! I love how this turned out. Well,if that's not just stink'in cute,or what?! I think I can do this in my Sunday School class.Thanks so much for the ideas you share! I love your post-it projects. I need to find a room in our house where I can do this! @ mommynoodles — As we were working on this, I thought it would make for a nice bulletin board display. Have fun!! @ An Almost Unschooling Mom — Thanks so much! I don't think the flower-shaped ones are hard to find. I bought ours at either Target or JoAnn's. They are a lot of fun, and just looking at them makes me smile! That is the most cheerful use of post-it's I've ever seen. I'd love to have that on my dining room — ummmm sewing room wall. That looks fantastic! What did you use for the stalks? Valerie, seriously – you are the coolest mom! I want to live in your house!!! Totally awesome! I have to bookmark this for next month! Beautiful! And such a nice reminder of spring for those of us drenched in rain! I love that she can take the flowers off and move them around. I love it! Awesome! I would love to do this in my daughter's bedroom! @ The Coffee Lady — I used green masking tape for the flower stems. Very simple! Of course, green paper strips would work well too. @ maryanne — We've been drenched in rain too lately. Blecck! Looks like a nice forecast for this weekend, though. Those look adorable. Very Springy. That is so cute and so simple. Oh I wanted to say that once again your idea is brilliant and inspiring, but as I rolled through the comments I had to laugh… as our dining room is also my craft and sewing area and unless we move somewhere with two extra rooms there doesn't seem to be any going back to "just a dining room". Too funny. I am going to tell my husband he's not alone. @ Committed Recycler — Ha!! I have a feeling we are not alone in conquering the dining room for a sewing/craft room. Too funny!! That's a really creative job you did there! I love the idea and it looks like a lot of fun, great job. Great Idea! I have extra wall space in my son's room, but flowers may not be the trick?!?! Wish they made sports post-its! Take a look, I have seen some in the past! I am pretty sure I’ve seen soccer ball post-its at least. For the tree branch, did you use the masking tape on the underside of the brand? like double it? sort of like double sided tape? Yes, that was it exactly. It worked beautifully! Have fun!! Hi Valerie,what did u use to make the stems and leaves and the little bee? can u get the rol of craft paper at michael’s? i’m loking forward to starting some projects with your help of course! 🙂 have a wonderful day!